I received this unassuming little pot of loveliness from the Liz Earle PR team back in January and left it to one side as I finished up the jar of Chanel Beauté Initiale that had served me well all winter. Coming into the sunny weather I wanted something less heavy and dug out the Skin Repair. That’s when I noticed what is really my only bugbear with this product: there’s no inbuilt SPF. But this isn’t an oversight - it’s a deliberate policy by Liz Earle which you can read about on their website and the company does offer a separate range of non-chemical suncare. Sunscreen aside, I’m getting on very well with this product. Although I’ve been using it now for about 6 weeks I’ve hardly made a dent as a little really does go a very long way. I use Skin Repair every morning after my Cleanse & Polish (which reminds me, I’m running low so must repurchase – I absolutely love this cleanser) and use a different night cream in the evenings – though you can, of course, use Skin Repair both morning and night. Packaged in Liz Earle’s trademark duck egg blue, which just happens to be my favourite colour EVAH, Skin Repair comes in an elegant 50ml tub that normally retails for €19.75. There are three formulations: mine is for normal/combination skin and they also cater for combination/oily or dry/sensitive skin types. The product is a delicately scented, off-white cream that feels quite thick and balmy but absorbs quickly. My face feels soft, smooth and nourished and the cream serves as a good base for makeup, too, as it leaves my skin quite matte. I still get the odd hormonal breakout around my chin, but where this has made a discernable difference is with the dry, flaky patches around my cheeks. These have been beaten into submission since I started using this product and my skin looks and feels more balanced, overall. 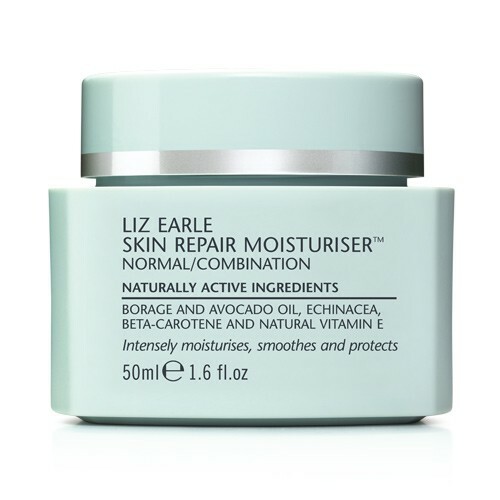 Like all Liz Earle products, Skin Repair Moisturiser is packed full of active, natural ingredients which include the wonderful sounding borage oil, derived from what the Romans called ‘the herb of gladness’ for its use in treating depression. The oil helps to lock moisture onto the skin and, with other ingredients like beta-carotene, echinacea extract and avocado oil, serves to replace lost moisture and deliver just the right level of hydration. Overall, this is high quality skincare that delivers results at affordable prices. What’s not to like? Buy Liz Earle online or from Wilde & Green in Milltown, Dublin 6. Never tried any Liz Earl but only hear good things so think I might defrost the ole credit card and give it a go!! Have you tried any other LE products? Need a new moisturiser and eye cream so might go for these...better be good now! I use this too, it's lovely. My stupidly sensitive skin really likes it. However, I can no longer use C&P, my skin hates it! So I'm on the look for a new cleanser. I have never used this product before but I must say after reading this I am very tempted. I have been using Clarins for the past year and I am quite happy with their products but there is always room for improvement. Liz Earle is hands down my favourite range of skincare products. The cleanser and muslim cloth are particularly amazing! I love Liz Earle and have tried a wide range of the products. If I was to pick one you haven't mentioned above that I'd highly recommend - it's the skin brightening treatment mask. It actually does what is says! I've never tried Liz Earle but keep meaning to, the fact that there is also a dry/sensitve version of this cream really pleases me. Liz Earle skin repair and C&P have made such a difference to my skin!! For anyone who hasn't tried them yet definitely worth investing in, you won't regret it. The Superskin moisturiser and concentrate are lovely products too. Anyone tried the LE eye cream? ?